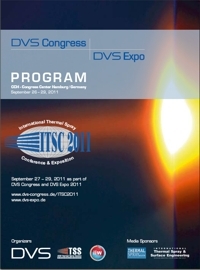 Finally the program for ITSC 2011 as part of DVS Congress and DVS Expo 2011 is ready! This extraordinary event will unite a total of eight important national and international conferences and research colloquiums under the same roof of the DVS Congress 2011. ITSC offers with nearly 200 lectures and over 160 poster presentations a new superlative for thermal spray information transfer activities. To complete the DVS Congress, the DVS Expo will take place for the first time in 2011. The ITSC exposition is integrated in the expo. This trade exhibition offers industry specialists the opportunity of presenting themselves within a unique environment. We hope that this event will meet your expectations and we look forward to welcoming you in Hamburg!